Lent is coming. This sacred season begins on Ash Wednesday, Feb. 14 this year. Isn’t it cool we can spend time with the Lord of Love on Valentine’s Day? I wrote about this church season previously on the posts titled How to Observe Lent and Be Ready for Easter, and Are You Ready? Lent is Coming Quickly. Do you know what Lent means? 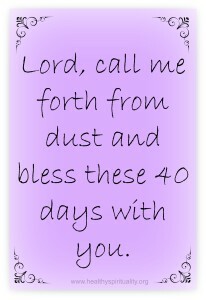 Lent is the 40 days before Easter, excluding Sundays. In French, the word “lent” means slow and is our invitation to slow down and be with God in new ways. How will you be transformed if each day we intentionally paused, prayed, and prepared ourselves for Easter? Create a daily quiet time with God. Carve out in the morning or evening or whenever at least 10 minutes of silence and prayer. Read a Lenten devotional such as 40 Voices during this season. Make pretzels to help shape your heart for prayer. Here is an article about how pretzels relate to this season and a recipe. Pause and breath in the aroma of the pretzels baking in your kitchen. Focus on how the dough feels in your hands. Nibble and taste as you slowly enjoy eating them. Pray about what brings you closer to God and add more of that during Lent. This could be silence, prayer, Bible readings, music. Pay attention what takes your heart away from God and fast from that during this season. Examples could be social media, television, high sugar foods, sarcasm, or using your credit card. You could fast from anxiety, speed, or busyness. Take something on — 40 days of letter writing, 40 acts of kindness, 40 phone calls to the important people in your life. Create a Lenten prayer altar. Equipping Godly Women has a great post about this. Lent can be a rich time of intimacy with God. Intentionally immerse yourself in this sacred season and be transformed in 40 days. God loves to surprise us in life-giving ways – Pay attention and you will see his work in you and around you. 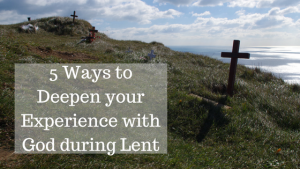 How do you plan to deepen your experience with God during Lent? P. S. My devotional for this season is available on Amazon. Check it out either as an e-book or in print. I love seeing reminders of Lent pop up because I need to start thinking about it more and more now, not just when it gets here. I want to be spiritually ready to dive into the season. Thanks, Jean! Hi Jean! I can’t believe Lent is so close either. Next week! There is something very meaningful about it all starting on Ash Wednesday too, love for love. I do like to ‘give up’ something during the season, but also think about how to add good actions too. Being aware of God’s light and love and presence each day is something I would like to highlight too. In 2013, you included Lenten prayers from St. Ephrem the Syrian, Ruth Haley Barton, and Thomas Merton in one of your blogs. I used them to write my own Lenten prayer. Think I’ll do the same with the prayers you’ve linked us to here. It’s a helpful exercise for confession, reflection and surrender. Thank you, Jean, for your inspiring suggestions! oops hit the wrong button before I finished. Sorry. … Taking the quotes as the basis for my own prayer. I will try that too. Thanks so much Nancy!! Jean, your video is absolutely inspiring as are your suggestions here for preparing, through Lent, for the joy of Easter. I’ve just begun reading a book “Invitation to Solitude and Silence” by Ruth Haley Barton in order to participate in a book discussion. It seems that God led me directly to this, placed it into my hands just in time for Lent. I haven’t practiced faithfully a daily time for silence AND solitude, so this will definitely become something I do this Lenten season and hope to carry on through the years to come. I will also be reading your 40 Voices again, too! I really like Ruth Haley Browns/ material. She has a podcast I enjoy too – called the Strengthening the soul of your leadership or something like that. She works out of Chicago and I would love to go to one of her workshops someday. Sounds like God is inviting you to silence and solitude during Lent! !